The Enterprise, along with the ship of her old nemesis Kor, becomes trapped in an empty void in space. There, they find members of several species who have also become trapped there. They tell the crews that there is no way home and out of necessity, they have all learned to work and live together in a community they have built, and that violence is strictly forbidden. Will the Enterprise find a way home? Will they be able to prevent violence from erupting with the Klingons if they don't? Captain, we'd really love to replace the shrub on the end. So don't screw it up! Kevin: This episode reminds me a lot, for obvious reasons of the similar Voyager episode, The Void. You got your empty void in space, your basic ragtag community of survivors convinced escape is impossible, your imminent power loss, and your villain whose antagonism threatens the one shot at getting out. I have to say, this version is on par with the later Voyager attempt. It's one thing for Janeway to have to assemble strangers into an alliance, it's another to have to forge it with a current enemy, as Kirk must do here. I liked the council scenes, with a few exceptions. I appreciated that there was a non-violent means of enforcing a non-violence policy. Consistency matters to me. I like that they made no attempt to stop the Enterprise. There's a tendency in these type of plots for the trapped people to not want to upset the order of things by allowing anyone to escape. I could find the idea that Scotty did in precisely twenty minutes what dozens of engineers couldn't do in years a tad over the top, but I don't. It's Scotty. It's what he does. The episode had a few weak spots for me, first in the character of Magen. Nichelle Nichols provides her voice, and it's not a good outing. It's shrill and seems to fall right into the "I'm in science fiction so I have make my voice warble in a falsetto" thing that is just not fun to listen to. Second, it was just a tad too deus ex machine for her to detect the explosive. 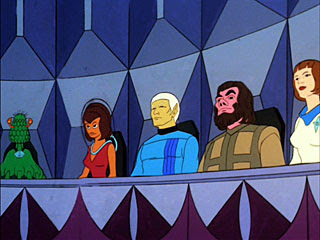 Also, as ever, not having the original voices for the Klingon captains is noticeable and not in a good way. In the plus column for the production team, the ship graveyard and the council chambers had a lot of nice little details if you were looking for them. Overall, I give this episode a 3. There's a reason this plot gets reused in Voyager. It's a good one. There isn't really anything here to elevate to the higher echelons. Matthew: I agree with you that Nichols is not at her best when doing alternate voice work. Majel Barret is beter at it, and her presence is missed. However, Doohan really impressed me. 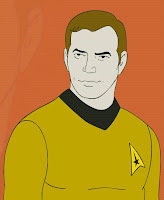 He did both Klingons Kirk negotiated with, and I had no idea before looking online. 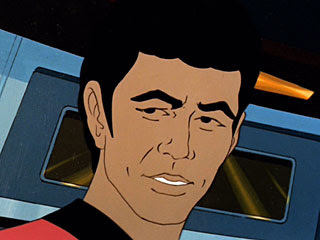 He also voiced the Barack Obama character. What am I talking about, you ask? It's time for a change you can believe in, Captain. Anyway, this is a very inventive plot, having not been done at all in TOS. I wonder how much of "The Void" was borrowed from this. I think "The Void" ultimately is a better show, but mainly this is because of the format. We don't get any actors with human faces to look at, and many scenes end up being shortened oddly, diminishing their effectiveness. With regards to the overall rating, I have to agree. This was heading for an easy 4, but it was held back by being animated and only 22 minutes long. But this is definitely a 3. That gives us a total of 6. I love your caption for Lieutenant Obama (I can't see his rank, so I'm guessing).